Kitchen Snaps: Wild Mushroom Risotto with White Truffle Oil ~ Paying it Forward! Wild Mushroom Risotto with White Truffle Oil ~ Paying it Forward! What's better than a hot bowl of Wild Mushroom Risotto on a cold and snowy night? 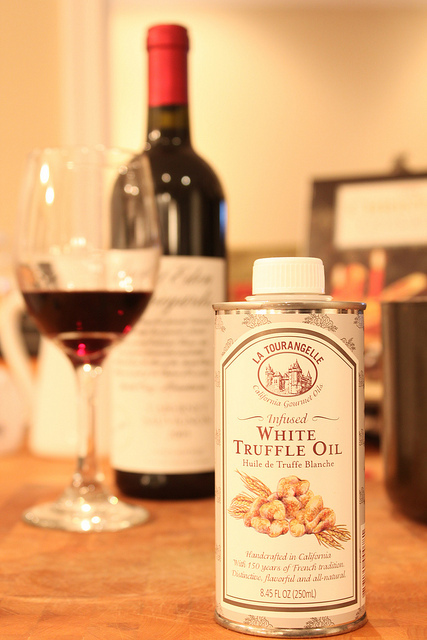 A hot bowl of Wild Mushroom Risotto with a glass of red wine, two great friends and this La Tourangelle White Truffle Oil our other friends got us for Christmas! We're thrilled to be "paying it forward"... as a little of the truffle oil goes a long way and tremendously enhances the flavor ~ of ANYTHING it touches! Love the post. The mushrooms look great and the white truffle oil looks delicious! I feel a little jealous....of the food and the friends....I'm not gonna lie. BUT I will turn that jealousy into inspiration an make this tomorrow night! It looks sooooooo goooood! Looks completely decadent. Wish I could have a taste. What kind of wine would go with that? Do you make all of your friends food with truffle oil?? Can I be in your circle?? We need to live closer together, ha! Imagine the tailgates?? Who would care about the game with DWD and the Food Hound supplying the eats! Hi Clint! I have to say I am no wine expert-though possibly an expert wine drinker ;)- but I think that while most might say a nice Chardonnay or Fume Blanc would go very well with this risotto...we all prefer red here and so last night it was an Oregon Pinot Noir that paired perfectly with the rustic mushrooms and flavor of the truffle oil! I know what you mean. Truffle oil gives so much aroma to everything. I am sure the risotto tasted great. I feel tortured...where do I find this - I need it in my life pronto! Risotto with truffle oil - ooh, la, la. Very fancy. Looks delicious. Haven't made risotto in a long time and this has inspired me. Where did you buy the truffle oil? Looks familiar, Williams and Sonoma? Whole Foods? Not sure where our friends purchased the La Tourangelle White Truffle Oil as it was a gift, but I just attached a link to the "La Tourangelle Product Page" in the body of the post ~ looks like tons of amazing products! Should be a good start! Oh boy. Not much could top this on a wintery night. I bet your friends were in heaven! Thanks for sharing and Happy New Year!! oh this looks like the best risotto I think I've ever seen! delicious! This looks perfect for a cold snowy night! Truffle oil risotto sounds amazing! I think you've just paid it forward again by inspiring me to go buy a bottle and make this! Now this is something I could eat every night!! Delicious!! Stunning! If I bring another good bottle of wine, can I pull-up a chair and join you? Awesome!!!!! I love cooking with truffle oil its flavor is amazing. This risotto looks great especially with the mushrooms, I will be trying this soon! Jumbo Lump Crab Cakes ~ Worth Every Penny!